William Izott Mitchell created this map while living in New York City. Mitchell apparently created the map for the amusement of his fellow members of the Kansas Society of New York City. 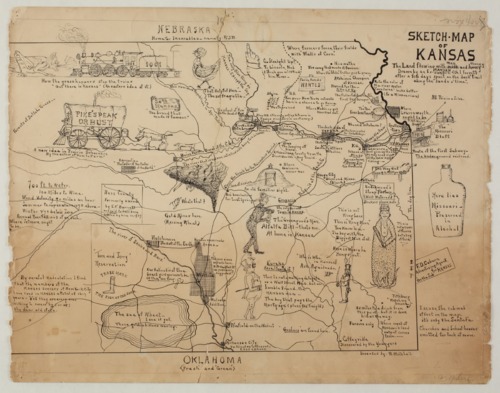 The cartoon map pokes fun of Kansas history and culture (often through word play) and draws humorous parallels between Kansas and New York City. Prominent themes include Missouri-Kansas animosity, the underground railroad, temperance and prohibition, the Atchison, Topeka and Santa Fe Railroad, Quivera and early Kansas explorers, farmers and farming, tornadoes, women's suffrage, drought and grasshoppers, and miners and mining. The back of the map includes a partially obscured inscription that reads "W. Mitchell, Zoological Park, New York City." Mitchell was the Cashier (accountant) at the New York Zoological Park (now the Bronx Zoo). He was at one time the President of the Kansas Society of New York. The undated map appears to be a fragment of a larger work but the whereabouts or existence of an additional fragment representing western Kansas is unknown.